The residents who are residing now and the evacuees who are thinking to return home in the future are desperately concerned with the water for drinking and agriculture. On the other hand, some study result says, most of radiocesium detected in the reservoir water is in the state of “suspension”, that means, the cesium has strongly bound to clay particles that are suspended in the water. Therefore the transfer of radiocesium to crops is very limited. Another opinion says, the effectiveness of the decontamination of reservoirs would be somewhat limited because contaminants would enter the reservoir again after decontamination. As the first step to understand the situation at the bottom of reservoirs, “Resurrection of Fukushima” measured a distribution of radiocesium level of the soil at a dried reservoir bottom. Obara-san, a member volunteer of the NPO, took the samples of the reservoir bottom at six locations in Tamano on February 12, 2014. Then “Circle Madei”, a volunteer group from the Faculty of Agriculture of Tokyo University carved each sample in 2 cm thickness, which was individually packed in a vial on May 12, 2014. And had the radioactivity measured using the NaI scintillation counter at RI Center of the Faculty on May 28, in cooperation with Assistant Professor A. Hirose. The following chart illustrates the distribution of radioactivity (dry weight base) in 0-14 cm deep at each point. The locations  and  were the state in which the soil still kept some moisture just after water has dried up, so these samples seemed to maintain the condition as that in the reservoir bottom under water. 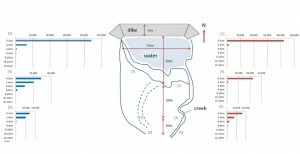 The other four points are the locations wherein it took some time after the reservoir bottom was dried out. Recently dried reservoir bottoms ( and ) contain higher level of radiocesium than the early dried bottoms ( and ). The recently dried bottom concentrates radiocesium in a much shallower depth (0-2 cm from the surface), than the early dried bottom. 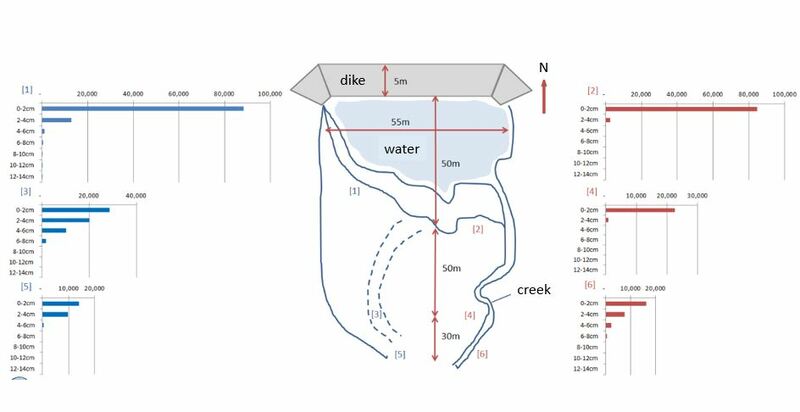 By extrapolating from this result, it is estimated that at the part where water still remains at the reservoir bottom, radiocesium concentrates in a much thinner surface and the level is over 100,000 Bq/kg of dry soil. If decontamination work of reservoir bottom is considered, draining water and scraping of the bottom surface by 2cm deep can reduce cesium level by more than 90%. But it is also likely that the drained water is entrained with contaminated sediments. And contamination may happen again if contaminated fallen leaves and soil on the mountains flow into the reservoir. We need to consider decontamination from a holistic perspective, including decontamination of forests. Rubble removal at nuclear power plant spread cesium to Iitate’s aerosol? In autumn of 2013, it was a very discouraging news for the farmers in Fukushima that Cesium levels in the rice crops harvested in Minami Soma exceeded the safety standard of 100 Bq/kg. Then almost one year passed, Asahi Shimbun revealed that the rice contamination in Minami Soma was very likely caused by the rubble removal work at Fukushima Daiichi nuclear power plant conducted in July, 2013. 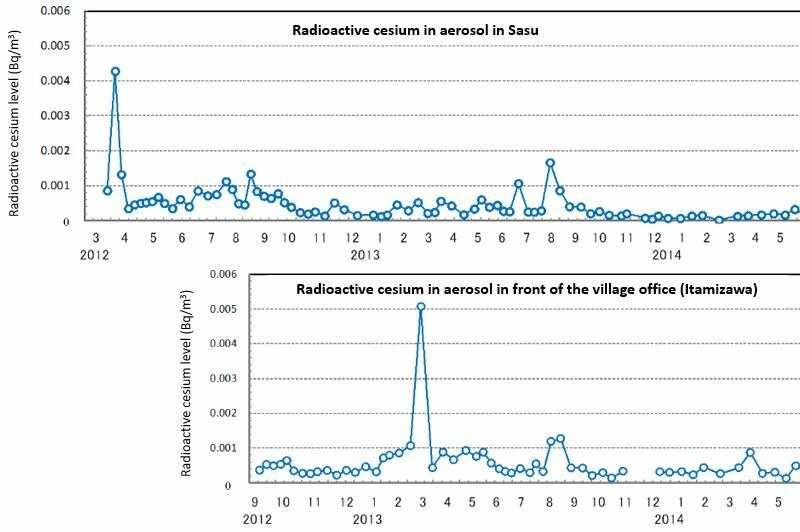 Professor A. Koizumi of Graduate School of Medicine, Kyoto University and four other scientists measured the Cesium concentration in atmospheric dusts and reported that 20-30 times higher level of cesium was detected at Minami Soma city and 6 times at Soma city. With the wind’s speed and direction at that time, as well as size of the collected particles, they concluded that the radioactive cesium of the rice in Minami Soma resulted from the rubble removal work at Fukushima Daiichi plant on Aug. 19, 2013. In March of 2014, the scientists presented their findings to the Ministry of the Environment. Tokyo Electric Power Co. (TEPCO) plans to clear the debris from the Fukushima Daiichi nuclear plant despite strong indications that earlier removal work contaminated rice paddies far from the area of the damaged plant. 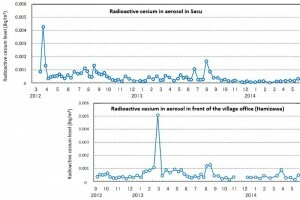 By the article of the Asahi Shimbun, we realized that the increase of radioactive cesium level in the aerosol of Iitate in August of 2013 was coincident with the rubble removal work in the nuclear power plant. In the article, a contamination map is attached, which shows the locations of air sampling with the results, and the locations of cultivated rice detected radioactive cesium higher than the standard level in Minami Soma. Reading the article (see the link: http://www.asahi.com/articles/photo/AS20140715005861.html), we recognized that Iitate being located near the western edge of the wide radioactive plume calculated by SPEEDI (System for Prediction of Environmental Emergency Dose Information), thus, has received some radioactive Cesium in aerosol samples. TEPCO appeared to have apologized to the Mayor of Minami Soma, however, another rubble removal is also reported to be scheduled. We hope that detailed information of soil contamination and hot spots will also be disclosed geographically in the same manner. Currently, decontamination work is ongoing for residential houses and farm lands, and the farmers are making desperate efforts to restart cultivation. Under these circumstances, additional contamination is completely unacceptable. Furthermore, it is difficult to identify the contaminant source, unless polluters spontaneously disclose the information. We strongly request TEPCO and the government to immediately disclose all the precise data on the rubble removal.